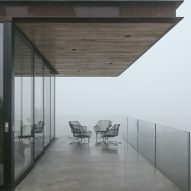 US studios Anacapa Architecture and Willson Design have created a concrete-and-glass dwelling for a coastal property in California, with a bevy of sustainable features that minimise the building's impact on the environment. The Off-Grid Guest House is situated within a wildlife preserve along the state's Central Coast, near the town of Santa Barbara. Nestled into a sloped site, the 800-square-foot (74-square-metre) dwelling offers sweeping views of the Pacific Ocean and the surrounding hills (when it's not foggy). Filled with sustainable elements, the building is meant to exemplify a successful balance between residential development and environmental preservation. 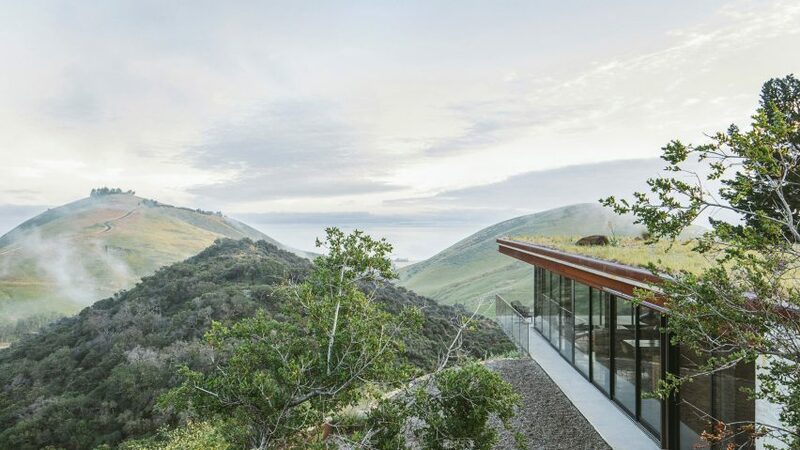 "A high level of sensitivity to environmental impacts was exercised throughout all phases of design and construction," said Anacapa Architecture, which designed the project in collaboration with Willson Design – both based in Santa Barbara. Situated a few hundred metres from the owner's main home, the low-profile guest house is composed of two adjoined bars, one of which cantilevers over the hillside. Walls are made of board-formed concrete and vast stretches of glass. A green roof with native flora, including succulents and poppies, helps the building blend with the natural terrain. 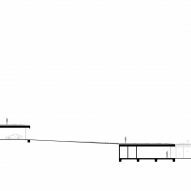 "The house is elemental, made of materials that integrate seamlessly with the landscape and that will weather and patina naturally over time," the team said. Inside, the guest house contains one bedroom, storage space, and an open-plan kitchen, dining area and living room. Glazed walls, sliding glass doors and an L-shaped patio offer an intimate connection to the scenic landscape. The interior features elements that are meant to add warmth and character. Exposed steel beams and concrete flooring are paired with a ceiling sheathed in black walnut. Rooms are fitted with contemporary decor, including custom pieces by Oregon-based Jessica Helgerson Interior Design. Like the property's main house, the guest dwelling is completely off the grid, as there are no electricity lines in the nature preserve. Power is provided by a photovoltaic system, with a propane generator available as a backup. Energy usage is kept at a minimum due to high-efficiency appliances and LED fixtures, along with sliding doors and operable windows that enable cross-ventilation. For chilly days, a radiant floor heating system helps keep the dwelling cosy. The home has a private well and water treatment system, and wastewater is directed to a septic tank and dry well. 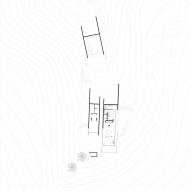 The project also included the construction of a detached garage, which was discretely built into the hillside. The guest house has enabled the owners, a retired couple, to provide accommodation for their visiting family members and friends. "The owners take solace in this space as an invitation to appreciate the natural beauty of this profoundly unique location – gathering loved ones for meals, sunsets and long leisurely weekends riding horses, surfing and sitting beneath the stars," the team said. Anacapa Architecture was established by architect Dan Weber in 2008 and took on its current name in 2016. Other projects by the studio include a luxury campground in Sonoma County that features customised tents and Airstream trailers, along with an open-air clubhouse. Photography is by Erin Feinblatt.